This volume presents a practical guide to the development, application and evaluation of effective interprofessional education in health and social care. It is both a practice manual for those in hands-on roles and a reflective guide for those indirectly involved in professional education. The book provides clear advice on methods of establishing training and education programmes and evaluating their effectiveness, while simultaneously examining the relationship between initial application, ongoing maintenance and subsequent assessment. The authors expound multiple points of view that will generate individual thinking and approaches to both the practice and the estimation of interprofessional education schemes. The book is divided into three sections: the first introduces the differing approaches to professional education and the rationale behind measuring their worth; the second part focuses on planning, development and delivery; the third part advises in a robust and pragmatic way on modes of measuring the efficacy of programmes. 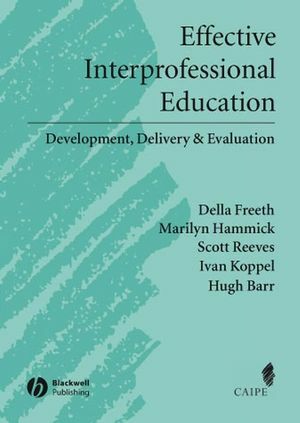 The interrelation of these topics is then examined to provide a synthesised perspective on the development, delivery and evaluation of interprofessional education. Part II: Developing Effective Interprofessional Education. Part III: Evaluating the Effectiveness of Interprofessional Education. 13. Using and Sharing Learning from Evaluations. "The end notes, references and index are helpful and comprehensive. In addition, the examples given throughout the text serve to disseminate information about a wide range of IPE activities delivered to various disciplines and with a range of evaluations and outcomes. In summary, this is a book of great value for educationalists."